The iconographic representation of the Meeting, in which the two saints meet in the open air, rather than in Elizabeth's house, first became popular in the painting and book illuminations of Netherlandish artists. 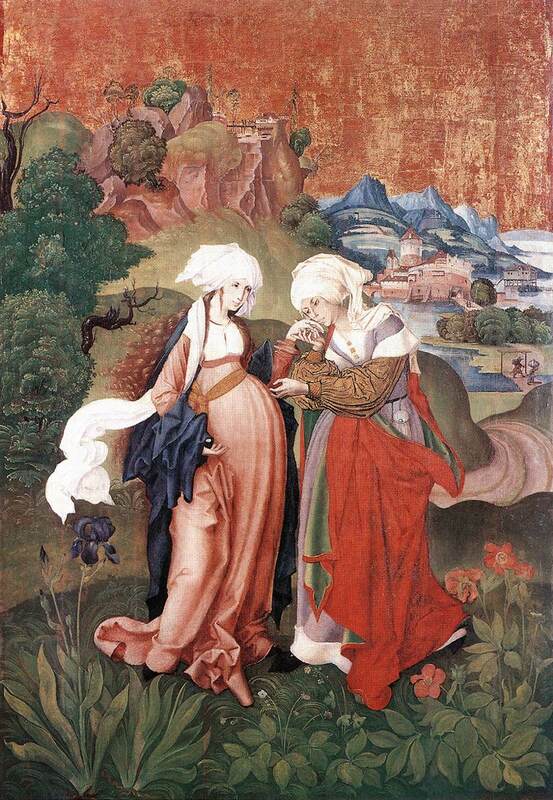 The painting depicts the meeting of Virgin and St Elizabeth, with poetic intimacy: Elizabeth recognizes Maria as the Mother of God and kisses Her hand. The idyllic landscape, which is in harmony with the figures, further enhances the poetic mood of the picture. The flowers iris and the peony shown in the foreground are the symbols of Maria. However, while in the paintings of Rogier van der Weyden, for example, the earlier mentioned flowers were modestly hidden in the meticulously painted grass, in Master M S's work they become the corner-stones of the composition. The representation of these flowers suggest the direct study of nature, which could have been associated with the wide spread of herbariums.